Background: Cinacalcet is one of the second-generation calcimimetics which consists of a chiral center. The pharmacological effect of R-cinacalcet is 1000 times greater than that of the Scinacalcet. As mentioned in many literatures, 1-(1-naphthyl)ethylamine is used as the starting material for the synthesis of cinacalcet. The absolute structure of cinacalcet is influenced by the starting materials. Methods: We present the chiral separation of cinacalcet and its starting material, 1-(1-naphthyl) ethylamine along with one of its intermediates, N-(1-(naphthalen-1-yl) ethyl)-3- (3-(trifluoromethyl) phenyl) propanamide by high-performance liquid chromatography with chiral stationary phase and chiral mobile phase additives. 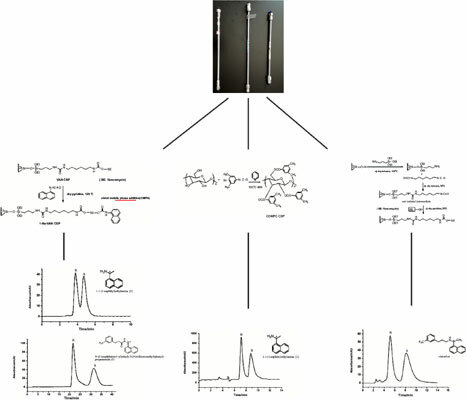 Results: On vancomycin and cellulose tri 3,5-dimethylphenylcarbamate) chiral stationary phase, cinacalcet and 1-(1-naphthyl)ethylamine achieved enantioseparation under normal phase with addition of triethylamine additives, respectively. Meanwhile, 1-(1-naphthyl)ethylamine and N-(1-(naphthalen-1- yl)ethyl)-3-(3-(trifluoromethyl) phenyl) propanamide achieved enantioseparation on 1-napthalene vancomycin chiral stationary phase using D-tartaric acid, diethyl L-tartrate and diethyl D-tartrate as chiral mobile phase additives. Conclusion: The chiral recognition in our experiment was based on the hydrogen-bonding, dipoledipole and π-π interactions among the solutes, chiral stationary phases and chiral mobile phase additives. In addition, the space adaptability of chiral stationary phases also affected the separation efficacy. Enantioseparation, cinacalcet, 1-(1-naphthyl) ethylamine, N-(1-(naphthalen-1-yl) ethyl)-3- (3-(trifluoromethyl) phenyl) propanamide, chiral mobile phase additive, chiral stationary phase.